Please note, although Pembridge Castle is privately owned and is not open to the public. The owners do not conduct public or private public tours. 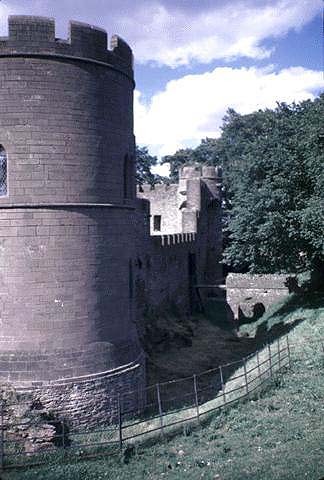 The lower part of the restored round tower (with fragments of adjoining curtain walls in sandstone ashlar) at the west angle of the rectangular moated enclosure may be of a date before 1215; the only evidence is the irregular round-headed doorway at ground level and the straight face to take the end wall of a rectangular hall. On the east side of this tower are the remains of a large chamfered arch, which must have led to further apartments. 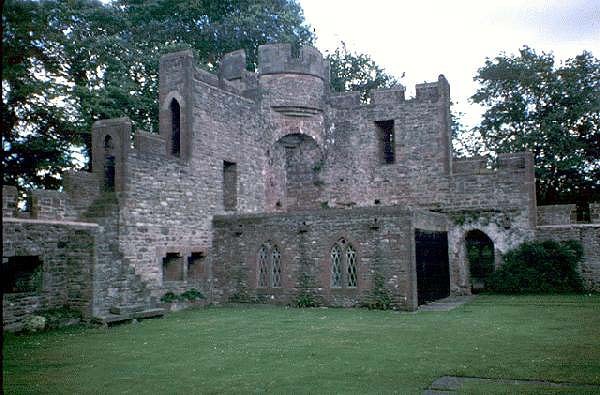 The hall, now adjoining, however is a XVIIth c. structure although its outer wall is of course part of the XIIIth c. curtain wall. This wall seems to date from the same time, mid or late XIIIth c. as the monumental gatehouse with its semi-circular towers. The right tower and the top of the left are XXth c. restoration. 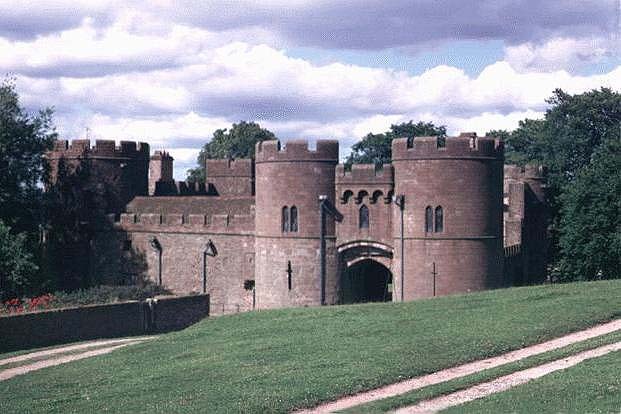 The gatehouse is in the east corner. To the NE the castle forms an oblong with the smaller round towers, not well preserved. The east angle tower is the more interesting. It is inside high up corbelled out. The north angle tower is close to the chapel. The tunnel vaulted undercroft of this is original, but the chapel itself is a XVIth c. building and the furnishings are all brought in, the screen from Essex, simple with one light division, bench ends with a poppy head, top of a four light wooden window with ogee headed lights. Heraldic stained glass of XVIIth c. Brasses of a Bishop and Knight 14" long. They are not mentioned in the R.C.H.M and it is not known where they came from. GREEN AD 1932 RE ORNATA EST. In the chapel is a note saying: - The castle was built in 1135 by Ralph de Pembridge. It was lived in by Sir Richard Burley in the reign of Henry VII, and later by Margaret, Countess Richmond and Derby in the reign of Queen Elizabeth. It was sold to Sir Walter Pye. In 1644 it was an outpost of the Royalists at Monmouth, and suffered severely during the Civil War. It was repaired by George Kemble and made habitable. The Roman Catholic priest John Kemble was arrested here and taken to Hereford jail and executed on August 22 1679 and is buried at Welsh Newton Church.The restoration of the towers and walls was carried out by Dr. Hedley Bartlett, an antiquarian and a Bishop of the lesser Eastern Church. The altar from Pembridge is now in the Roman Catholic Church at Monmouth. The first certain information concerning the Richard de Pembridge who is buried in the nave of Hereford Cathedral is in 1340 when he is found, already a knight, at the Battle of Sluys. Six years later he was present at Crecy. In 1355 he followed Edward III again to France, and in the next year fought at Potiers. In later life he held many official positions, one of them being that of a chamberlain of the Royal Household. He was elected a Knight of the Garter in 1368, occupying the fourth stall on the prince's side in the chapel of the order, but his last years were passed somewhat in disgrace, owing to his refusal to take up the thankless post of Lord-Deputy of Ireland, perhaps the reason was advancing age. King Edward deprived him of some of the grants which he had formerly made, but he must presently have relented, for Sir Richard Pembridge certainly died in possession of lands donated by the King. The table tomb still occupies the position in which it was placed according to the terms of Sir Richard's will, on the south side of the nave before the statue of the virgin. The effigy has been restored, but it is in the main,with the exception of the right leg, the original work of the XIV th century. It is sculptured in alabaster and shows the baron in full contemporary armour of mixed mail and plate, the basinet type of helmet laced to the camail or hood of mail. The head rests upon a tilting helmet, the latter being adorned with a wreath or coronet of roses, and a plume of green feathers. With the effigy is that of Sir Richard's favourite hound. There are still traces of colour and gilding on monument and figure, notably on the helmet and sword-belt, both of which were gilded. On the left leg is the Garter: this is one of the earliest examples of its appearance on a monument"